A little beach-y card today! I'm not sure who makes this cute stamp (if you have any idea, please let me know) as it was given to me quite a while back and there's no name on the wooden block. I love this little gals hair - sorta looks like mine on some days. The blue polka dot DP is some that's now retired from SU and the yellow gingham strips just appeared in all my papers from somewhere. I embossed the white with the Spots and Dots folder and added some Glossy Accents to the dots on the little dragon floaty. The ribbon - ah, I've been looking forever for some yellow gingham type ribbon and just couldn't find any - so Carol (Our Little Inspirations) was so nice and sent me some! Thanks again, Carol. 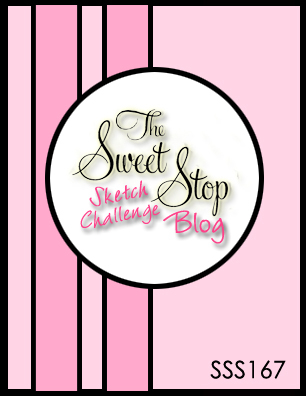 I followed the sketch from Sweet Stop Sketches and will enter it their challenge. I'll also enter it in the challenge at Top Tip Tuesday (It's all about Circles). Adorable, Lynn! Love all the polka dots and your blue and yellow combo. Great way to match up the gingham strips with the bow. Love your take on the sketch! Fun image and I like the colours you've used. No clue who makes the stamp but it certainly is cute! Such a happy little face. Your background paper looks just like a pool liner. Great pick. enjoy your day. I love all your fabulous dots mixed with your checks and this delightful image!! A great celebration of everything that summer is, Lynn! Awww, love her in her floaty!!!! You colored her up great!! Yah! You got some yellow gingham. How nice of Carol. Hope you're cooling off down there! Big storms today and we should be at 70 degrees on Friday! She'a a cutey and the I love the polka dots on her float! What a fun Summer card! Adorable Lynn! Love the pretty yellow gingham ribbon with all the blue! Super fun summer card! Too cute! Love those colors and the added glossy accent. What a sweet card! Love the darling image cut out... the dry embossed panel and paper with dots look great! 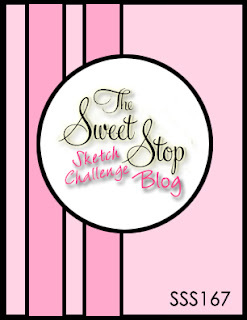 Thank you for playing along with us at The Sweet Stop this week. Very cute and summery - did you feel as though you were going round in circles by the end of it ? ;-) The gingham was a great foil to the circles. This makes me want to jump in a nice, cool pool! The image is adorable and I love the floatie! Your paper and ribbon finish it off so nicely and the whole card just says 'summer'! Oh this is SPOT-tacular! (Sorry, couldn't resist the pun.) Your card is so cheery it made me smile. This is perfect, some of what we have been doing, fun in the pool, but I don't have a fun float like her. Love the colors and of course your coloring. Loving that perfect bow. What a lovely fun card Lynn! I love the blue and yellow together. I can relate to the hair - my hair has a life of its own that's far more interesting than mine! Cuter than cute!!! 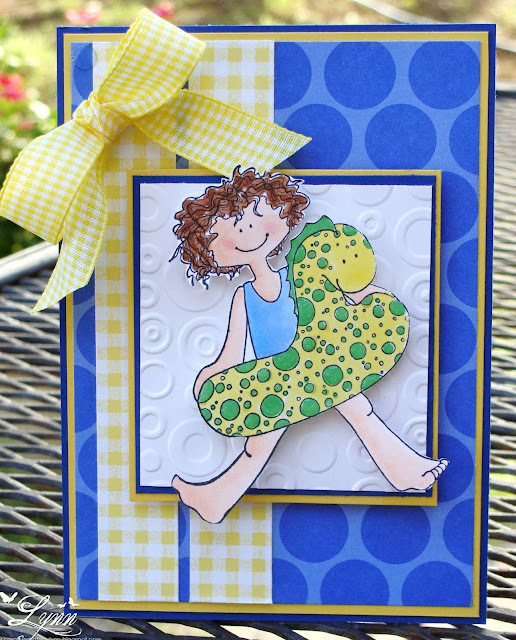 I just love yellow and blue color combos, and your layout and colors really make the green dots on the floatie pop!! Such an adorable image too. Great job. Cute image and love the perky dots and checks! Fabulously fun card. I love the embossed swirls, they look like waves. oh my goodness! the gingham and the big polka dots are looking absolutely gorgeous together. the colours are just perfect and so is the image. Too cute Lynn!! I LOVE that sweet image and all of your fabulous dots!